What is the TAG Registry? 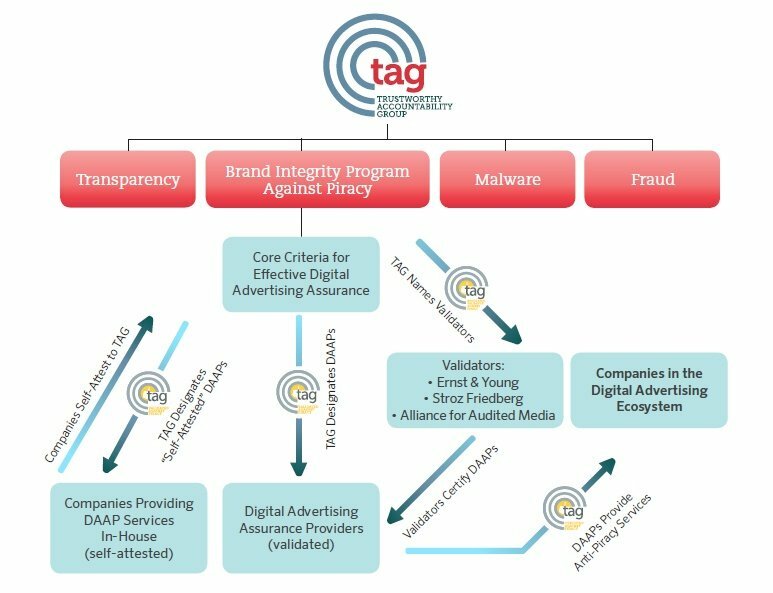 In order to solve the challenges of fraud, malware, piracy and transparency facing digital advertisers today, legitimate companies need a way to identify responsible, trusted players across the entire digital advertising ecosystem – to ensure that they are working with trusted parties at every step of their ventures. The TAG Registry makes that possible, providing a Who’s Who of trusted partners for any company involved in digital advertising, and creating a protected system of supply chain participants and other advertising technology companies that demonstrate their commitment to higher standards of transparency and disclosure to their partners. Your browser must support iframes to use this function. Each company that successfully completes the “Verified by TAG” process receives a TAG-ID, a unique, global and persistent identifier that enables you to identify your partners across the digital supply chain. Your company can share its TAG-ID with partners – or ask partners to provide their TAG-IDs – as a means of verifying legitimacy and reputation. Use the TAG Registry to “look up” TAG-IDs provided by your partners in order to verify that a company is indeed a known and reputable “TAG Registered” partner. You can verify a company’s status in the TAG Registry by entering a Company Name or its TAG-ID. If you are not sure whether your digital supply chain partner is TAG Registered, enter its Company Name to learn its status in the TAG Registry. If your supply chain partner has provided its TAG-ID as a means of verification, enter that TAG-ID in order to confirm the company to whom that identifier has been assigned. Please note that the TAG Registry will not reveal a company’s TAG-ID when a Company Name is entered, as a TAG-ID can only be disclosed by the company to whom it is assigned. “Acme Company’s TAG Registration status is Active. If a company cannot be found in the TAG Registry, it may be because the Company Name entered is not an exact match to an active company in the TAG Registry, or because a company’s TAG Registration status has expired. Please check that you have correctly typed in the Company Name. If you are still unable to validate a company’s status, please ask your digital supply chain partner for the exact Company Name on its TAG Registry listing. If an identifier cannot be found in the TAG Registry, it may be because the identifier is not an exact match to the TAG-ID of an active company in the TAG Registry, or because the TAG-ID is valid but associated with a company whose TAG Registration status has expired. Please check that you have correctly typed in the TAG-ID provided to you by your supply chain partner (noting that TAG-IDs are not case-sensitive). If you are still unable to find the TAG-ID in the TAG Registry, please contact your digital supply chain partner for additional information. If you have questions about the TAG Registry, or how to become “TAG Registered,” please contact TAG at info@tagtoday.net.